‘Daktari unahitajika ward (Doctor you are required in the ward).’ The nurse sounds tired. She is overworked, being one of two nurses there caring for a ward with 80 patients. This is far from the WHO recommended nurse:patient ratio of 1:6/10. I find a patient convulsing, an empty emergency tray and the pharmacist informs me that we have been out of anticonvulsants for more than a month. The patient is dead when her kin returns with the drug from a private pharmacy in town. 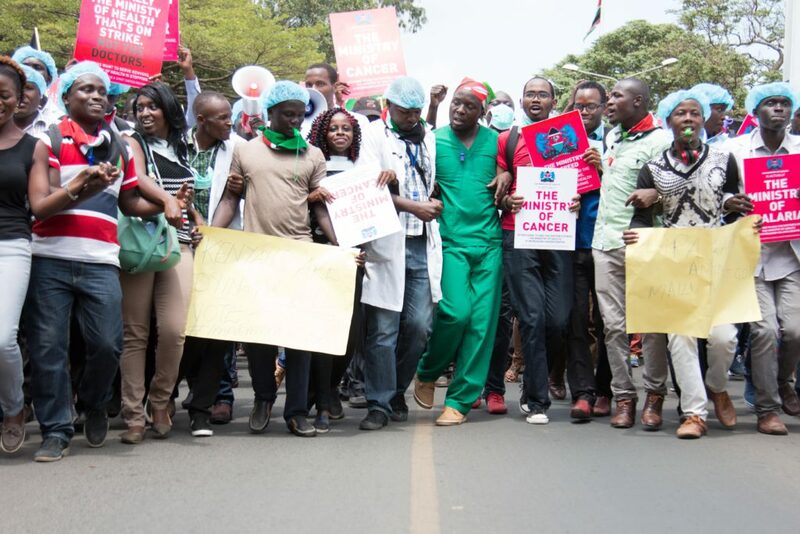 For years, Kenyan doctors have been reduced to supervisors of patients’ deaths and we see this strike as the beginning of the path to redemption. One could easily trip over several patients lying on the floor because all the beds already are occupied by two patients. On display are archaic blood test machines and x-ray machines which haven’t been working for the last two weeks. The donated ambulance at the parking lot has also been out of service for the last 2 months. 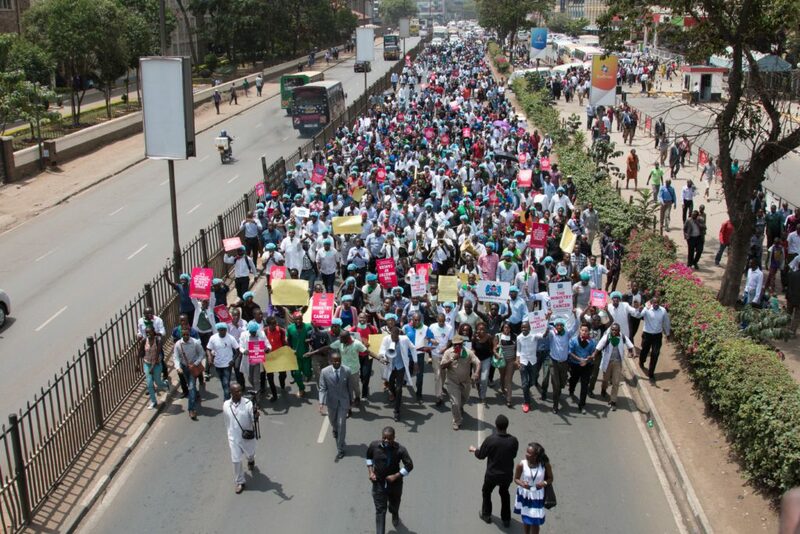 Kenyan doctors’ protests, January 2017 (Brian Maugo). A mother mourns her deceased new-born because she went into obstructed labour at home, and the only means for her to get to the hospital, 60 km away, was on a bodaboda (motorcycle). It is with an air of irony that doctors noted that the First Lady, Margaret Kenyatta, once again announced her annual Beyond Zero marathon which has been held for the last 3 years to raise funds to improve maternal and child health. Yet her husband heads a government that is constitutionally mandated to address this need and has failed to support its doctors. To add to the irony, the Ministry of Health, using taxpayers’ money, are also large donors to this private campaign. Due to the politicization of the agenda, the First Lady has recently issued a statement cancelling this year’s marathon. The quest to have fully equipped hospitals is constantly hampered by ingrained corruption and government inefficiencies. For example, Kshs 30 Million (US$300,000) worth of medical equipment was returned to its Swedish donors after the donor declined to pay out Ksh 2 million of kickbacks to have the consignment cleared at the port. In light of all this extravagance, the doctors’ demands for the new pay structure will set back the government only Ksh 8.1 billion annually for 4,500 doctors in public service. Despite this, the government in the last 6 weeks, has undermined the CBA and repeatedly offered a 40% increase in the emergency call allowance and a “presidential gift” of Ksh 10,000 ($100) as a risk allowance. This is very different from what was pain-painstakingly agreed upon in the CBA that involves special banding of doctors’ remuneration, because of the unique nature of our work as civil servants, working odd hours and repeatedly endangering our own health and lives. Furthermore, there is an ongoing suspended prison sentence for the top seven union officials, which has been used to blackmail them to call off the strike. They however have remained firm and refused to give in. The integrity with which the government has handled negotiations with doctors has also been called into question. The Telegraph India reported that the Indian government through their Prime Minister Narendra Modi had “sidestepped” a proposal from Kenya to fly doctors from India to fill the gap created by the strike, during a state visit to India by Kenya’s president, Uhuru Kenyatta. The other proposed source of doctors was Cuba who have remained silent on the issue. Even though the government has denied these claims, we question the seriousness and commitment that they bring to negotiating with doctors. The Minister of Finance recently admitted that the reason why they do not want to pay doctors a decent salary in the public sector is because this would cause an influx of doctors from the private to the public sector, hence private hospitals would collapse. With more than 95% of Kenyans relying on public facilities, it should go without saying that health is a public function. From the approximately Ksh 50 billion (US$500m) our National Health Insurance (NHIF) receives, Ksh 33 billion (US$330 m) goes to private hospitals, Ksh 10 billion (US$100m) goes to India for treatment of Kenyans there and only Ksh 7 billion (US$70m) goes to public hospitals of which only Ksh 4.2 billion (US$42m) goes towards free maternity care. Government interests are clearly skewed away from catering to the public’s needs. On the other hand, private hospitals are known to exploit doctors, paying them as little as Ksh 55,000 (US$550) a month. While the public provision of health services is thus undermined, international investment companies are flocking in seeking to invest in private healthcare in Kenya, because it is a ’honey pot’ for a rising middle class. Our very own private facilities are also investing billions of shillings in expansions. Does this mean that access to healthcare will become a privilege not a right? The vultures are indeed circling around the carcass that is public health care, but doctors shall continue fighting for the ordinary citizen to have access to the best attainable health in this country. Dr. Judy Karagania is a Kenyan medical doctor currently working in the largest referral hospital in the region, Kenyatta National Hospital, while pursuing her postgraduate studies in Ophthalmology. She obtained her medical degree from the University of Nairobi and afterwards went straight into the public health service at the second largest referral hospital in Kenya, Moi Teaching and Referral Hospital, in Eldoret, then later worked at a smaller hospital in Naivasha. 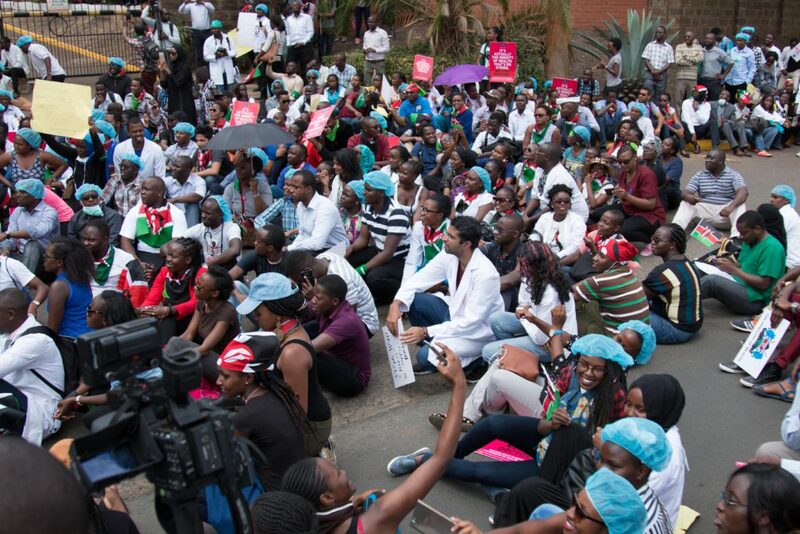 Featured Photographs: Kenyan doctors’ protests, January 2017 (Brian Maugo). Section 138 of the County Government act and part 187 of the Kenyan constitution. The transition authority had advised that devolution of Health should be done slowly, but it was very quickly executed. Business Daily, July 23, 2013. Kenyan Legislators emerge second in global pay ranking.